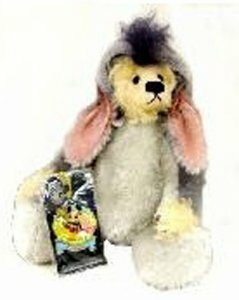 12",2005, Blond mohair bear is dressed up in a Eeyore costume and wants to be Eeyore and be noticed too! He is the WDW Doll And Bear Convention 2005 edition and comes with the convention pin and is signed by the artist. He is made of hand dyed mohair, has Austrian crystal eyes, ultra suede paw pads and hand embroidered features. He is glass bead and poly filled and the hood is removable. Smaller version of the WDW 2002 LE "Thanks for Noticing Me, Too!